To stay motivated with your fitness over a long period of time means ensuring you vary your workouts from time to time. Keeping things varied and interesting stops you from getting bored, and seeing your workouts as a chore. In addition, varying your exercise may also shock your body into actually achieving something new. That is after all, how developmental exercise should work. Ask yourself; when was the last time you mixed things up with your exercise routine? It doesn’t matter how you choose to keep fit, be it gentle walking or gruelling gym sessions. When was the last time you tried something exciting and different? 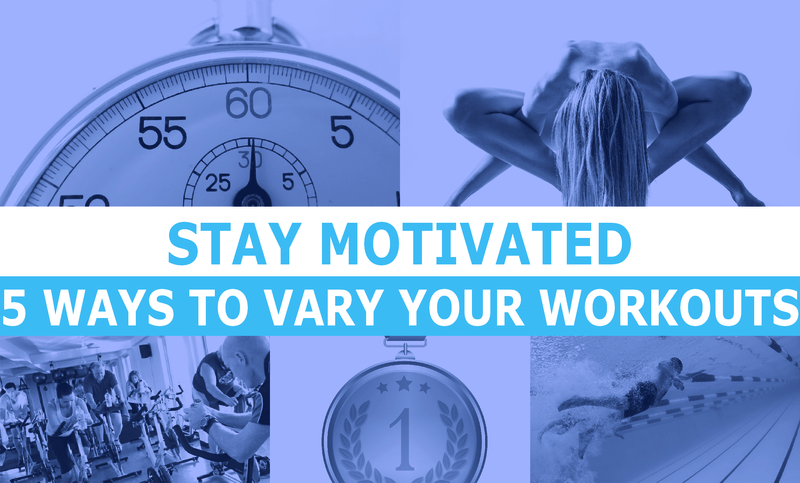 To help you stay motivated and break the monotony of the same old routine, here are five tips to vary your workouts keep you focused, energised and feeling good. Take yourself out of the comfort of your normal routine by introducing a challenge which will mean achieving a Personal Best (PB) at something new. It could be to bench press your bodyweight, to run a 10k race or to take part in a Tough Mudder challenge. It could also be as simple as starting to exercise if you aren’t incorporating any kind of training at present. Make a list of the types of challenges which excite you most – An exercise ‘bucket list’ of sorts. Simply, pick one of your challenges and begin planning your workouts by making small steps toward achieving it. You can’t beat the feeling of achieving something you never once believed you could! Another great way to stay motivated is to workout in a completely different environment. It sounds simple, but it works! For example; on a nice sunny day off from work, I will complete my legs and abs session outside in the fresh air. I swap Barbell Squats and Dumbbell Lunges for Plyometrics (jumping and bouncing based exercise), and finish my core work on the grass with the sun on my face. You could introduce H.I.I.T interval sessions in a swimming pool or instead of your long run, go on a challenging bike ride instead. Changing and varying your exercise sessions are a great way to keep things fresh and feeling new. Another way to stay motivated is to try something completely brand new. For example; For ‘gym bunny’s’, switching to a yoga class will help you with your flexibility and strength work. If you are a runner, going to the gym to add some stabilisation exercises to your training regime will compliment your existing training. When you are time poor and resent going to the gym which you feel cuts into your day, train at home with nothing else needed but a chair and the floor. Another option to mix up your workout is to follow others. Insanity, lead by fitness guru Shaun T, is a fantastic home workout programme which I have used on many occasions and highly recommend. Take away the the stress of wondering what to do next and maximise your workout time efficiently and effectively. It’s a fact working harder in a shorter period of time is more effective for boosting fitness, burning fat and has a more positive hormonal effect on the body than slower, longer duration based workouts. Stop wasting valuable time and maximise your workout potential by giving yourself a strict time limit to workout. A good place to start is around the 30 min mark. In that time, you can effectively warm up, workout and stretch out to relax. It’s a great way of feeling like you have had a fantastic training session in a short space of time and still have the time for other things which are equally important. Training either in a group or with a partner is another great way to boost motivation. Social exercise provides support, encouragement, empathy and, dare I say, even a little competition to help push give you that extra push. You could go to an exercise class at your local gym, join a running club or even set up (or join) a local Facebook exercise group with like minded people. The list is endless and you have the added benefit of making new friends! What do you do to vary your workouts? Leave me a comment below and share your thoughts. If you like this article please remember to SUBSCRIBE for fresh Health and Fitness content every Wednesday, straight to your email Inbox.